03:05:00 Makes 14 servings, 1/2 cup each. This frosty treat takes only 5 minutes to prepare. Use your favourite flavour of KOOL-AID and make our KOOL-AID Italian Sorbet recipe - your family will thank you! GRADUALLY stir water into soft drink mix in large pitcher. Stir until drink mix is completely dissolved. Pour into 8 -inch dish; place in freezer. FREEZE 3 hours or until firm, removing dish from freezer every 30 min. to scrape mixture from sides of dish. 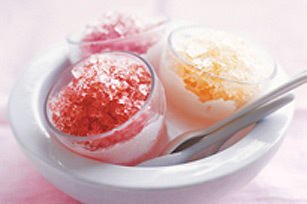 Remove sorbet from freezer about 10 minutes before serving to soften slightly. Serving Size Makes 14 servings, 1/2 cup each.